Reference anywhere on this website (the “Site”) to “KP Tissue” means KP Tissue Inc. and reference anywhere on this site to “KPLP” means Kruger Products L.P. and all, or one or more, of its affiliated companies. The Site is owned by KP Tissue. KP Tissue may monitor access to, use of and other activities relating to the Site, and may intervene in relation thereto but does not make any representation or warranty that it will do so. You hereby consent to any such monitoring and intervention. The materials on this Site, which may include the underlying HTML, text, images, audio clips, video clips, software and other materials (the "Content"), are provided by KP Tissue for informational purposes only. KP Tissue intends the Content on the Site to be accurate and current. Nevertheless, since the Content has been compiled by KP Tissue from a variety of sources, it is provided to you "as is" and "as available", without warranties of any kind. This Site may contain typographical errors and certain inaccuracies. Any consequence of any decision you make based on any part of the Content is your sole responsibility. NEITHER KP TISSUE NOR KPLP ASSUMES ANY RESPONSIBILITY TO YOU OR ANY THIRD PARTY FOR ANY ERRORS OR OMISSIONS OF ANY KIND IN THE CONTENT AND DISCLAIMS ALL WARRANTIES, REPRESENTATIONS, CONDITIONS, GUARANTEES OR ENDORSEMENTS, WHETHER EXPRESS OR IMPLIED BY LAW, STATUTE, TRADE USAGE OR OTHERWISE, WITH RESPECT TO THE CONTENT AND TO ANY MATTER RELATING TO THE SITE, INCLUDING BUT NOT LIMITED TO, IMPLIED WARRANTIES AND/OR CONDITIONS OF MERCHANTABILITY, OPERATION, NON-INFRINGEMENT, TITLE, USEFULNESS, COMPLETENESS, ACCURACY, ADEQUACY, CURRENCY, RELIABILITY OR FITNESS FOR ANY PARTICULAR PURPOSE. WITHOUT LIMITING THE GENERALITY OF THE FOREGOING, NEITHER KP TISSUE NOR KPLP GIVES OR MAKES ANY EXPRESS OR IMPLIED WARRANTIES, REPRESENTATIONS, CONDITIONS, GUARANTEES OR ENDORSEMENTS TO THE EFFECT THAT THE SITE WILL OPERATE ERROR-FREE OR THAT THIS SITE AND ITS SERVER ARE FREE OF COMPUTER VIRUSES OR OTHER HARMFUL MECHANISMS; OR THAT ANY SUCH PROBLEMS THAT ARE DISCOVERED WILL BE CORRECTED. IF YOUR USE OF THE SITE RESULTS IN THE NEED FOR SERVICING OR THE REPLACEMENT OF EQUIPMENT OR DATA, NEITHER KP TISSUE NOR KPLP IS RESPONSIBLE FOR SUCH COSTS. Links available on the Site (the "Links") will allow you to link to websites not maintained or controlled by KP Tissue. KP Tissue provides these links for your convenience, and is not responsible for the contents of any linked website. Using such Links is at your own risk. 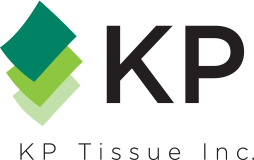 KP Tissue cannot and does not warrant the accuracy, completeness, non-infringement, merchantability or fitness for any particular purpose of any information available through the Links, and makes no representation or endorsement whatsoever about any other website, which you may choose to access through the Site. Although KP Tissue uses all reasonable efforts to ensure that all software provided on this Site is suitable for use on a wide variety of computer systems, it is your responsibility to take all reasonable and appropriate precautions to scan for computer viruses and ensure compatibility of any such software with your specific computer system. IN NO EVENT SHALL KP TISSUE OR KPLP OR THEIR RESPECTIVE DIRECTORS, OFFICERS, EMPLOYEES, AGENTS OR REPRESENTATIVES BE LIABLE FOR OR OBLIGATED TO PAY ANY CLAIMS, LOSSES, COSTS, EXPENSES OR DAMAGES WHATSOEVER, INCLUDING ANY DIRECT, INDIRECT, SPECIAL, INCIDENTAL, CONSEQUENTIAL, PUNITIVE, EXEMPLARY OR SIMILAR DAMAGES, INCLUDING, BUT NOT LIMITED TO, LOSS OF DATA, BUSINESS INTERRUPTION, OR LOSS OF ANTICIPATED REVENUE, PRODUCT OR CONTRACT, ARISING OUT OF OR IN CONNECTION WITH ANY USE OF THIS SITE OR ANY OTHER SITE YOU MAY ACCESS THROUGH THIS SITE, OR WITH ANY USE OF ANY CONTENT AVAILABLE OR REFERRED TO ON THIS SITE OR OF ANY MATERIALS ON ANY OTHER SITE THAT YOU MAY ACCESS THROUGH THIS SITE, EVEN IF ADVISED OF THE POSSIBILITY OF SUCH DAMAGES. The aforementioned exclusions and limitations shall apply whether any claims, losses, cost, damages or liabilities are founded in contract (including fundamental breach), or are extra-contractual or founded in tort or any other theory of liability and such limitations and exclusions shall apply even if KP Tissue or KPLP has been advised of the possibility of such claims, losses, costs, damages or liabilities. Because some jurisdictions do not allow the exclusion or limitation of certain types of damages, including moral, bodily, incidental or consequential damages, KP Tissue’s and KPLP’s liability in such jurisdictions shall be limited to the extent permitted by law. At KP Tissue's sole discretion, KP Tissue may terminate or refuse to permit the use of this Site by any person or entity, for any reason and without notice. KP Tissue may investigate any occurrence of any of the above-mentioned violations and may involve and cooperate with law enforcement authorities in prosecuting any user involved in any such violation. Certain statements made on the Site, which describe KP Tissue’s or KPLP’s intentions, expectations or predictions, are forward-looking and are subject to certain risks, uncertainties and therefore a number of factors that could cause the results or events predicted in these statements to differ materially from current expectations and from actual results or events. You should not place any undue reliance on these forward-looking statements. KP Tissue and KPLP disclaim any intention or obligation to update or revise any forward-looking statements, whether as a result of new information, future events or otherwise unless required by applicable laws. The trademarks, logos and service marks displayed on this Site (collectively the "Trademarks") are registered and unregistered trademarks of KP Tissue, KPLP or of third parties. Nothing contained on this Site shall be construed as granting, by implication, estoppel or otherwise, any license or right to use any Trademark without the express prior written permission of KP Tissue, KPLP or such third party as may own any Trademark. Your misuse of any Trademark or any other Content on this Site is strictly prohibited. Not all of the logos, trademarks or trade names of KP Tissue or KPLP are necessarily used on this Site. The absence of any logo, trademark or trade name of KP Tissue or KPLP from this Site does not constitute a waiver of any intellectual property rights of KP Tissue or KPLP regarding any such logo, trademark or trade name. Except for software expressly identified as being owned by KP Tissue or KPLP, any software available for downloading through this Site is provided by third party software vendors pursuant to license agreements or other arrangements between such vendors and end-users. Neither KP Tissue noR KPLP sellS, resellS, licenseS or sub-licenseS any such software on the Site, and KP Tissue and KPLP disclaim any responsibility or liability related to the software. Any questions, complaints or claims related to the software should be directed to the appropriate vendor. You are solely responsible for adequate protection and backup of the data and equipment used in connection with any software downloaded through this Web site. In the event of any express inconsistency between these terms and those contained in any license agreement with a software vendor, the terms contained herein shall prevail. Any comments, material, information or other communication you transmit or post to this Site ("Submission") shall be considered non-confidential and non-proprietary. Neither KP Tissue nor KPLP shall have any obligations with respect to your Submissions. KP Tissue and KPLP and their respective employees, agents and representatives shall be free to copy, disclose, distribute, incorporate and otherwise use your Submissions and all data, images, sounds, text and other things embodied therein for any and all commercial or non-commercial purposes. KP Tissue and KPLP reserve the right to edit, re-purpose or re-publish any Submission in any medium for any reason with proper credit to the author. You agree that no joint venture, partnership, employment or agency or other business relationship exists between you and KP Tissue or KPLP as a result of your use of this Site. KP Tissue operates and controls this Site from its offices located in the Province of Ontario, Canada. Neither KP Tissue nor KPLP makes any representation that the Content is appropriate or available for use in any other locations. If you choose to access this Site from outside of the Province of Ontario you do so through your own initiative and you are responsible for compliance with local, national and international laws, if and to the extent that such laws are applicable. KP Tissue reserves the right to delete, modify or supplement any Content from the Site, in whole or in part, at its sole discretion, at any time, without notice to anyone. KP Tissue et vous-même êtes réputés avoir convenu que les présentes conditions d’utilisation et tous les documents connexes soient rédigés en anglais seulement.